Home » Pensions & Benefits » Want an office that’s good for your health? Want an office that’s good for your health? A recent survey from the Confederation of British Industry, in partnership with Bupa and HCA Healthcare, found that 63% of companies viewed workplace health and wellbeing as an important business issue. So, there's a real push to make sure offices are healthy, happy places to be. The good news is that there are a range of simple steps that can be taken to help support mental and physical wellbeing in the workplace, according to Vicky Peacock, Interior Designer at leading property group, Bruntwood. The company has embedded wellbeing best practice at buildings within its wide portfolio of office space across Manchester, Liverpool, Leeds, Cheshire and Birmingham. One such simple step, she suggested, is ensuring that your workplace has lots of different ‘zones'. "There's increasing recognition being given to the damaging impact that our sedentary ways of working are having on our health. In 2016 the British Journal of General Practice published a paper asking whether ‘sitting is the new smoking," she explained. According to Vicky, to tackle this, businesses should provide "A range of different places for people to work. 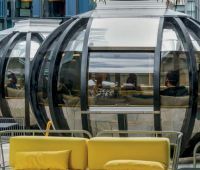 At Neo in Manchester for example we have a large open-air roof terrace which includes all-weather meeting pods, while our Grade II-listed Cornwall Buildings in Birmingham features fully refurbished communal lounges and meeting rooms filled with natural light. Attractive break-out, soft and collaborative spaces like these can be very effective in encouraging workers to leave their desk and stretch their legs." Workplace design should also encourage workers to stay active in other ways, said Vicky. "Everything from providing cycle racks and showers and changing rooms in our buildings, to supplying communal spaces to host pop-up virtual fitness classes - as we do in partnership with Les Mills at our Trafford House building in Manchester for example - can help improve employee wellbeing." Light is also important. "Natural light is always best," said Vicky. "Where artificial lighting is used, it should be attractive, sympathetic to surroundings, with the option to adjust the lighting around you to the time of day and the task you're working on," she recommended. And don't forget plant power! "Gardens, roof terraces or simply decorating your spaces with plentiful indoor plants can really have an impact on wellbeing and not just because it's aesthetically pleasing," said Vicky. Indeed, research from CBRE has suggested that the addition of plants to the workplace can boost productivity by 10% and can even lead to a huge 65% of workers saying they feel happier at work. Paying attention to factors like these can help businesses build their competitive edge - both through increased productivity and retention. Because when you look after the health of your workforce, it's not just employee wellbeing that gets a boost, it's often the bottom line too. Click here for more information on how Bruntwood can provide you with the spaces and support to help your business thrive.